The report underscores the company’s continued evolution of corporate responsibility, from environmental stewardship to broader societal impact. It also demonstrates how CA’s Corporate Social Responsibility (CSR) progress is linked to its business and positively benefits customers, employees and communities around the world. Environmental Progress: In 2017, CA reported a total of 47,841 metric tons of GHG emissions, approximately 50 percent lower than in 2006. The 50 percent reduction — or 47,347 metric tons — is equivalent to taking 10,139 passenger vehicles off the road for one year, according to the Environmental Protection Agency. CA is committed to achieving its next GHG reduction target of 40 percent by 2030, based off a 2015 baseline. Trust and Security: CA offers identity and access management solutions that empower its customers to take a proactive approach to enterprise security. In 2017, CA bolstered its security capabilities with the addition of Veracode to its suite of solutions. It enables developers to run a dynamic security scan for a deployed Web application to track release content from planning to production. CSR Initiatives: CA has expanded its focus on advancing STEM learning through partnerships and programs with organizations including 100Kin10, AnitaB.org, Boys & Girls Clubs of America, Citizen Schools, Code.org, DonorsChoose.org, Girls Who Code, NPower and PENCIL. UN Sustainable Development Goals: CA has embedded the UN’s Sustainable Development Goals (SDGs) into its sustainability strategy to help accelerate progress. Skills for the Future Workforce: CA recently announced its goal to reach 50,000 under-18 students in Europe by 2020 to inspire them to consider future careers in science, technology, engineering and math (STEM fields), and to help address the chronic skills gap. The company is also a founding partner of the World Economic Forum’s IT Industry Skills Initiative, an effort committed to reskilling one million people with resources and training opportunities on the SkillSET portal by January 2021. Employee Engagement: CA has implemented a global New Parent Leave policy that offers all employees a minimum of 12 weeks paid leave during the first 12 months following the birth or adoption of a child. This new benefit enhances CA's overall offering for families worldwide and strengthens its commitment to creating an inclusive culture that promotes gender parity. CA also supports all working parents with a range of benefits and programs that center around work/life balance, flexibility and opportunity. Inclusion and Diversity: In 2017, CA expanded its Unconscious Bias training to in-person workshops and CA CEO Mike Gregoire signed the CEO Action for Diversity and Inclusion™ pledge. Customer Solutions. CA’s Modern Software Factory is where agility, automation, insights and security work together to power a company’s digital transformation in the application economy. This philosophy has sustainability built in — from the efficiency gained and time and resources saved through automation to the stability and security CA is providing to the digital economy to help enable business continuity. 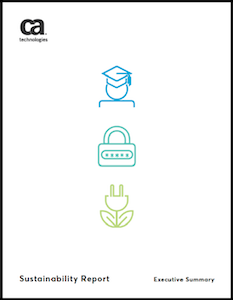 CA Technologies works to maximize opportunities for its customers’ IT operations by providing an efficient platform that limits resource use and products that strive for sustainability in all respects. CA aims to ensure that its products reduce impact by making efficient use of physical resources, like materials and energy, throughout their life cycles. CA Technologies (NASDAQ:CA) creates software that fuels transformation for companies and enables them to seize the opportunities of the application economy. Software is at the heart of every business in every industry. From planning, to development, to management and security, CA is working with companies worldwide to change the way we live, transact, and communicate - across mobile, private and public cloud, distributed and mainframe environments. Learn more at www.ca.com.